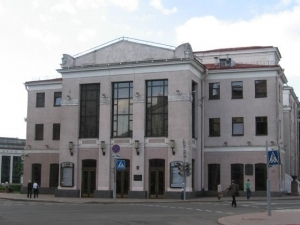 Yanka Kupala National Theater is the oldest theater in Belarus. It was opened on the 14th of September, 1920. The first performances were originated from Belarusian folklore and works by Belarusian writers. But with the advent of Evstigney Mirovich in 1921, the theater's repertoire grows, and foreign works start to be produced on the stage as well as home ones. The theater was on the real rise in the sixties, as it was a new period in its development. This period can be called modern. Productions by V. Raevsky and B. Luzenko bring in the spirit of newness and freedom. Under the direction of Valery Raevsky, the theater becomes more liberated in expressing feelings and thoughts on the stage. The new director managed to find that golden mean between the novelty, emancipation, and experiment, on the one hand, and classical tradition on the other hand. All this made his theater truly unique.For thirty years that he was a director of the Yanka Kupala National Theater, V. Raevsky managed to produce lots of pieces by such authors as Shakespeare, Gogol, Durrenmatt, Brecht, Dostoevsky. But special attention has always been given to national writers like V. Bykov, N. Matukovsky, E. Shaban and others.